The government is making Ontario open for business and open for jobs by cutting red tape, lowering business costs, creating apprenticeship opportunities and modernizing employment and training services in the province. Providing $3.8 billion in provincial corporate income tax relief over six years through faster write-offs of capital investments under the Ontario Job Creation Investment Incentive. Proposing to cut red tape so smaller video game developers can apply for the Ontario Interactive Digital Media Tax Credit annually and get their tax credits faster. Reviewing how cultural media tax credits are administered to reduce the application backlog and help companies get their tax credits faster. Introducing the Open for Jobs Blueprint to modernize business support programs and make sure they are helping create jobs and grow the economy. Committing to cut the small business Corporate Income Tax rate by 8.7 per cent. Supporting the reduction of the Workplace Safety and Insurance Board’s (WSIB) average premium rate from $2.35 to $1.65 on every $100 of insurable payroll, effective January 1, 2019, which will save employers an estimated $1.45 billion in 2019. Enhancing consumer confidence by adopting title protection for financial planners and financial advisors to strengthen professionalism and improve efficiency and competitiveness of the financial services industry. Fostering economic growth and addressing unnecessary regulatory burden with a new five-point plan to create confidence in Ontario’s capital markets. The focus of this plan will be to strengthen investment in Ontario, promote competition and facilitate innovation. Launching targeted stakeholder consultations on industrial electricity pricing, with a view to helping Ontario businesses manage electricity costs. Calling on the federal government to press the United States administration for immediate and permanent removal of its tariffs on Canadian steel and aluminum, and to ensure that no other trade impediments such as quotas are introduced. The following chart illustrates a number of actions the government has already taken to reduce costs for businesses. 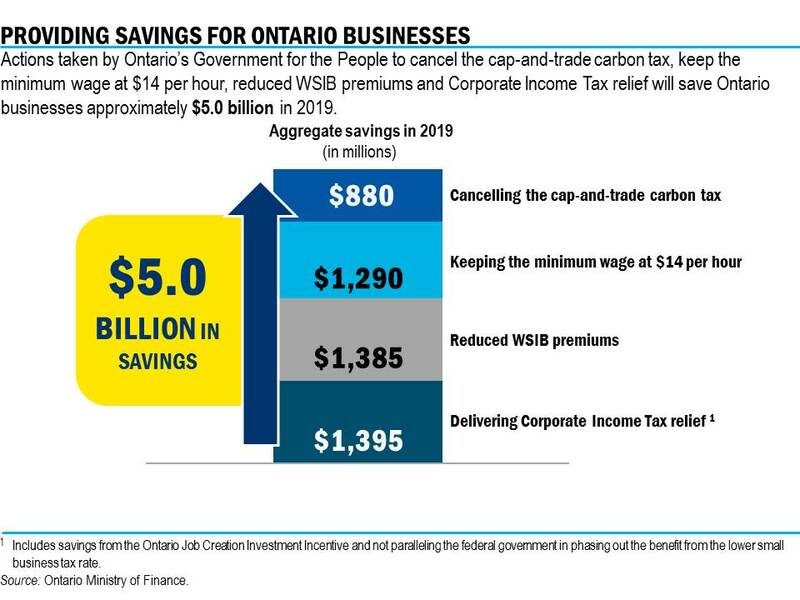 Collectively these initiatives are estimated to save Ontario businesses $5 billion in 2019. Establishing programs that encourage the people of Ontario to enter skilled trades, get retrained and become aware of the benefits of good-paying jobs in the trades. Developing a one-window digital portal for apprentices. Mobilizing Employment Ontario’s Rapid Re-employment and Training Services program to help General Motors and Fiat Chrysler workers regain employment as quickly as possible. Lowering tuition rates by 10 per cent for students at every publicly funded college and university starting in the 2019–20 school year, and freezing tuition fees for the 2020–21 school year. Letting students choose the non-essential fees they want to pay, which can add up to as much as $2,000 per academic year. Setting incentives for postsecondary institutions to provide the education and training students need to get jobs by tying 60 per cent of their funding to performance outcomes by the 2024–25 school year.